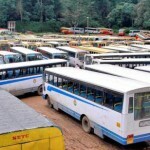 For Sabarimala Pilgrimage season 2018-19, only KSRTC buses will be allowed from Nilackal to Pampa. Nilakkal (20Kms away from Pampa) would be the base station for Sabarimala piligrims for Season 2018-19. Private vehicles will not be allowed between Nilakkal and Pampa.